A full-color paperback edition of Prince Caspian, book four in the classic fantasy series, The Chronicles of Narnia. This edition is complete with full-color cover and interior art by the original illustrator, Pauline Baynes. 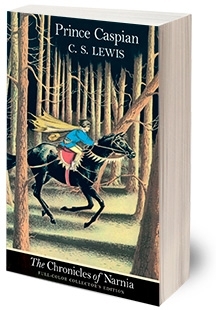 A battle is about to begin in Prince Caspian, the fourth book in C. S. Lewis's classic fantasy series, which has been enchanting readers of all ages for over sixty years. This is a stand-alone novel, but if you would like to see more of Prince Caspian's adventures, read The Voyage of the Dawn Treader, the fifth book in The Chronicles of Narnia.